The Food Asset Map may be difficult to use for some with so many cluttered information, especially for those with a language barrier. It may be difficult for many immigrants to access food that they find culturally acceptable upon their arrival to Vancouver. A translated instruction video could teach these food insecure people how to use the Food Asset Map and ultimately, access food they deem culturally acceptable. After completion of both a Chinese and English version of the Food Asset Map instruction video, we went into the community to trial it. Our aim was to found out how it can improved to better cater to the community members who would actually be using this tool. We went to Vancouver Neighbourhood House to meet with 7 Chinese speaking seniors. Most of these seniors spoke both Cantonese and Mandarin. During the trial, we first showed our audience the video and opened up the floor for them to ask questions and give feedback. We had them fill out a feedback form afterwards but they had difficulty with it as it was in English. With further translation and guidance, we were able to obtain solid feedback from a small sample from the community. A big issue that kept popping up with each of the surveyed individuals was that the even though the instruction video was in Chinese, the actually Food Asset Map and the information on it was still in English. We trialed the English video on another day with fellow students at UBC. The feedback was very positive as the was no language hurdle and a majority of our sample reported that they would use it in the future. We are finalizing our objectives and pooling all the data that we collected to present it to our class and community partners. In addition, we will begin writing our final report and have completed our infograph which will give our audiences clear and concise information regarding our project. With this trialing process and the feedback from our surveyees, we hope to relay this information to those who work on the food asset map for them to improve upon the tool and to also improve upon the instruction video to make it clearer for all. We also hope to mitigate the difficulty of being food secure by reducing any language barriers towards the Chinese. According to the Business Inside, Vancouver is one the 3rd most expensive city to live in in the world and 13% (Holmes, 2017) of its households experience food insecurity on top of the the big food security problem in Downtown East Side. The Food Asset Map could help everyone in the community, especially the food insecure. The next steps will be to continually improve access and clarity of the map both directly and indirectly through our video. Having the people know that such a tool is available for their use and improving awareness of the food insecurity issues amongst them would also be important part of future plans. We hope to expand to other languages to accommodate more cultures and ethnicities in the future. The last thing we would want is for a family to not be able to find affordable food because they couldn’t understand or had no knowledge of our Food Asset Map. Notes: The upcoming weekly objective and strategy are slightly different from that in the second post because we would adjust according to the progress we make along the way. 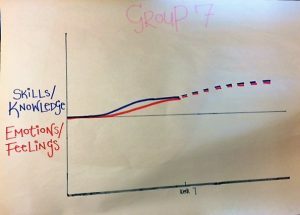 During this week’s tutorial, each group was asked to draw a graph to indicate their knowledge and emotional changes throughout the past few months. The x-axis is the time (independent variables) and the y-axis is either the levels of knowledge or the stages of emotion (dependent variables). After completion, every group presented with their plot and shared their stories about the project. We included all the elements in one graph. The blue line represents the skills/knowledge and the red line represents the emotions/feelings. The dotted lines represent what we believe the knowledge we can gain and emotion status in the future. Thank you for this activity which inspires us to recall memories and reflect on what we have been doing since the beginning of this Food Assets Map project. For the first couple weeks, we didn’t communicate and interact frequently since we were not familiar with each other and also the project itself. Therefore, we started the plot with a flat line. After the meeting with the Vancouver Coastal Health Dietician Teya, we were much clearer on the instruction and goal of this project. We later figured out the type of video and consulted the technician for technical support. We made such a great progress during week 7 (spring break) which can be marked as our moment of significant change. The spring break allowed us to have sufficient time to meet and work together. We separated the group in half: 3 people working on the first half and 3 people working on the second half of the video. No one in the group has made a video before. It was definitely a challenge for us, but we were confident that we can conquer the difficulties. We started to get our hands on the software Camtasia and had a general idea of what the video would look like. Despite the video was not finished completely, we were pleased with the progress we made and looking forward to the community trial. During the ongoing process of this project, we always remind ourselves the initial purpose of making the video. The How-To video serves as an instructional tool which educates people to take advantage of the Food Assets Map. People can find food related resources on the Map. It might seem that the map just has a simple function, yet it can be crucial in people’s daily life. For example, people with low income can’t afford fresh vegetables and fruits; or people with food allergies need special diet. They can look for the organization or community center that can provide help on the map. The map benefits two sides at the same time: the food resources are not wasted and people can get the real support to address their food concerns. The map definitely increases food security in the Vancouver Neighborhood and take positive approach to the poverty issue. A good educational video can help reach more audience which amplifies the significance of the map. Our target audiences are people who prefer to speak English, Mandarin and Cantonese. According to 2011 Census (Statistics Canada, 2016), 56% people identified English as mother tongue. The population of Cantonese and Mandarin speakers ranked the second and third in the non-official language group. Therefore, more than half of the people in Vancouver have no language barrier when watching the video. In summary, we hope that more people who are fluent in different languages can join this video project to reach more audiences and promote the Food Assets Map. The main goal we set for ourselves is to create a video that is simple and easy which enhances the usability. During this process, we predict that we will gain skills steadily and improve the quality of video according to the advice from audience. We will also keep our positive attitude towards every challenge for the next following weeks. It is only fair if everyone in the group makes contribution to the project. The feeling of fair is important to get a person motivated and get the work done efficiently. Each member is in charge of different parts of the project according to their strengths or preferences. The main goal of our project is to create a Food Assets Map video in three languages. This is a new project so we can’t look for references from previous years like the other groups. Another big challenge is that none of us have made a video before. Therefore, it is crucial for us to often communicate with Teya for clarity of the instruction and consult with the technician for technical support. Thanks to the technician, we find out there are four free softwares available on the Connect. We used a few softwares for this project such as Camtasia and sound recorder. In order to get familiar with these softwares, we watched instructional video on Youtube and asked the technician for help. We first made a video without sound and subtitles as a baseline. Then we recorded the scripts in three different languages and added corresponding subtitles. When we presented the video to the seniors in South Vancouver Neighborhood House, they got confused about the concept of food assets and also some categories listed in the map as well. They initially thought that food assets are just where they can purchase and get food. 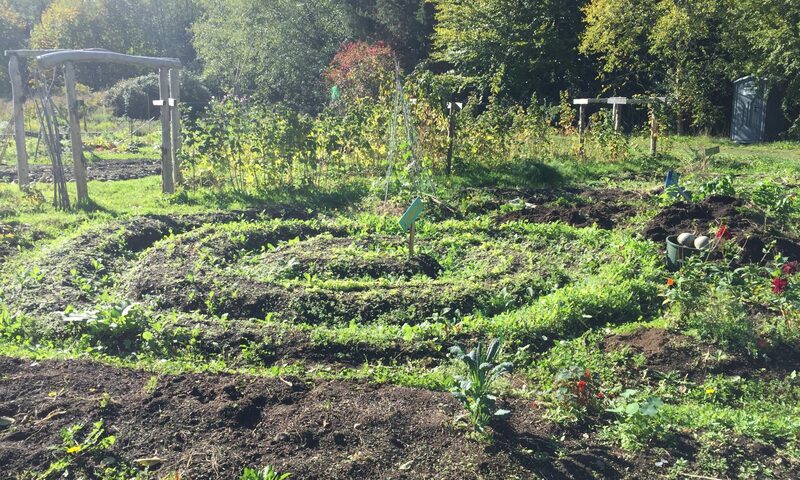 The definition given by Vancouver Coastal Health is that food assets are “places where people can grow, prepare, share, buy, receive or learn about food”. After we explained the definition to them, they realized they can find food-related workshops or community gardens on the map. We also show them how the map can improve food securities in variety ways. For example, they can look for free or low cost meal on the map which can address the concern of affordability. Affordability is one of the important components of food security (Power et al., 1998). The demo video educates people how to use the map and also promotes the food security in the Vancouver Community. Power, E. M., Sheeshka, J. D., & Heron, A. L. (1998). Canadian dietitians’ understanding of food security. Journal of Nutrition Education, 30(1), 45. We are now halfway through the course. As we are making food asset map videos in English, Mandarin and Cantonese for the community, our goal is to educate individuals on how to effectively use the map. The population growth in Vancouver has been increasing steadily due to the increase of immigration to the city. With that in mind, food security needs to be ensured to the new immigrants as well. Therefore, Vancouver Coastal Health, UBC and our community partners created a food assets map. The food assets map is a relatively new tool that helps people allocate, buy, prepare and receive food. To increase the number of users of the food assets map, our strategy is to create an instructional video in English, Mandarin and Cantonese. While making this video, we also have the chance to meet with one of the computer technicians from UBC to gain more knowledge about video filming techniques, such as vivid voiceover, classic animation and abundant pictures. By making videos in three different languages, we hope that this tool can reach out to people who are more comfortable using Mandarin and Cantonese. It is important to recognize Vancouver’s diversity and our project helps to accomplish this bridging the gap between the Chinese community and the rest of Vancouver’s population. Ernesto Sirolli (2012) states that listening and working with different community members can achieve success. With knowledge from the technician and community partners, we are currently in the process of filming a convincing, yet educational video. As we are continuing to work on our project, our goal is to make our video easy to use and follow. In addition, we want to be able to show people how to use the food assets map in order to make the map a useful tool in their lives. We also hope to receive feedback from our community partners to test the effectiveness of our videos. Hi, welcome to our blog! First, we’d like to introduce ourselves. Stephani Fan: A third-year student in Food, Nutrition and Health program; interests: photography and hiking. Imogen Li: A third-year student in Food, Nutrition and Health program; interests: cooking and yoga. Irene Cao: A third-year student in Nutritional Sciences program; interest: reading novels. Renee Huang: A third-year student in Food, Nutrition and Health program; interest: playing badminton. Travis Lam: A third-year student in Food Market Analysis program; interest: playing basketball. Manessa Man: A third-year student in Food Market Analysis Program; interests: traveling to experience different cultures and food, and baking. If you ask me to use one word to describe Vancouver, “diversity” would be the first one that comes to my mind. Food is diverse in Vancouver. It is not so hard to find burritos, sushi and grilled steak on the same street. So are the languages. If you get on a bus, you can always hear someone speaking in a language other than English. Unfortunately, the diversity also reflects in living conditions. Some people enjoy nutritious meals every day, while some people constantly struggle with food insecurities. We are a group of people who are passionate about food as well as food justice and food securities. Through the course LFS350, it is very fortunate for us to pair up with the dietitians from Vancouver Coastal Health to make a short how-to video for Vancouver Food Asset Map. Vancouver Food Asset Map is a useful tool which helps people living in Vancouver find food assets in their communities. Considering that Chinese makes up a big portion of Vancouver population, we are going to make a video in Mandarin as well. We would like to learn from the dietitians how to plan and carry out a large-scale project. It is also very important for us to reach out to communities so that we can better understand the disadvantages and advantages of Vancouver system. We strongly agree with the concept of asset-based community development. Instead of posing ourselves as experts, we want to be listeners and servers in the community (Mathie & Cunningham, 2003). People in the community eat and have to eat. They already know a lot of ways to find food assets so we can learn from their successful experience and perfect the map. 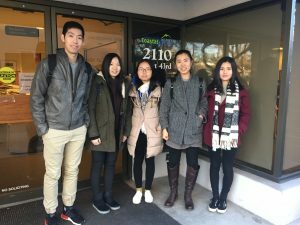 Through the process of interacting with dietitians and our community partners, we hope that the videos we make will provide food access for more people, especially who are Chinese from low-income families and having difficulty understanding English. Introduce the concept of Vancouver Food Asset Map to the public and educate people how to utilize it. Improve and update the Vancouver Food Asset Map constantly. During this Tuesday, we had our first meeting with the dietitians Teya Stephens and Kathy Romes, from the Vancouver Coastal Health. They introduced us to the project of Vancouver Food Asset Map and would provide support throughout the process of the project. We all feel confident and excited, and can’t wait to start this project. In addition, the video that we make will be released in the community. As Ernesto Sirolli mentioned in the video, “sit[ing] with the local people” is the best way to target the key problem and improve the project because no one better than the community members themselves know what their real struggles are (Sirolli, 2012). By gathering their responses, we can know what difficulties they have on obtaining food assets or understanding the video. It enables us to improve the video to suite their needs. At the end, as parts of the Vancouver communities, the main goal that we participate in that project is that people can learn more about the Food Asset Map and utilize it in the daily life to promote a healthy eating lifestyle. Sirolli, E. (2012, September). Want to help someone? Shut up and listen! Speech presented at Ted Talk. Retrieved January 25, 2017.